In a recent post in Education Week, Justin Reich (@bjfr) strongly encourages teachers who have iPads in their classrooms to make their teaching visible. He recognizes that schools are quickly adopting this tool for instruction, but is concerned that teachers are not sharing what they are doing with others through social media. Justin goes on to say that in order to develop a vision of how iPads can be effectively used in schools, we need to see how other teachers are augmenting their instruction and then discuss these strategies. I couldn’t agree more. Even though I love my iPad, I have been somewhat hesitant to just throw them in classrooms and see what happens. (I recently wrote a post about my experience piloting these devices last year.) We are somewhere in the middle on technology integration; our school is not 1:1, but all teachers have an iPad and more are possibly on the way for students in the form of a mobile lab and classroom workstations. The approach I have taken in my school is to teach the teachers first on how to use them, in addition to encouraging them to explore the possibilities. You could break this learning process down into two categories: Model It and Celebrate It. I recently discovered the app Felt Board and instantly recognized the potential it has in the primary literacy classroom. I could share this app through email, or even download it specially for teachers whom I think would benefit from using it in their instruction. However, the best approach I have found for introducing technology tools to teachers is through interactive modeling. For example, I recently used part of my regular read aloud time in my kindergarten classrooms to recreate a part of a story I just shared. I used a document camera and asked students to help me develop the scene, incorporating both visuals and words. Once completed, I snapped a photo of it to the Camera Roll. Then we used iMovie to record one of the students reading the text from the board. Picture and audio were uploaded to Vimeo and we were then able to share it with parents at home through the web link. Here are three we created so far. I have also used iMovie on the iPad to create book trailers. Here is my son sharing one of his favorite books and why he likes it. For more information, Matt Gomez (@Matt_Gomez) wrote a post about Felt Board and how he uses it in his kindergarten classroom. Like the app, it is well worth a look. My staff are starting to use these devices in highly effective ways, without a lot of support from me. It is exciting to see what they come up with. For example, when I walked into my school’s library this morning, I saw a display set up by one of my second grade teachers, Mrs. Heyroth (@MrsHeyroth). 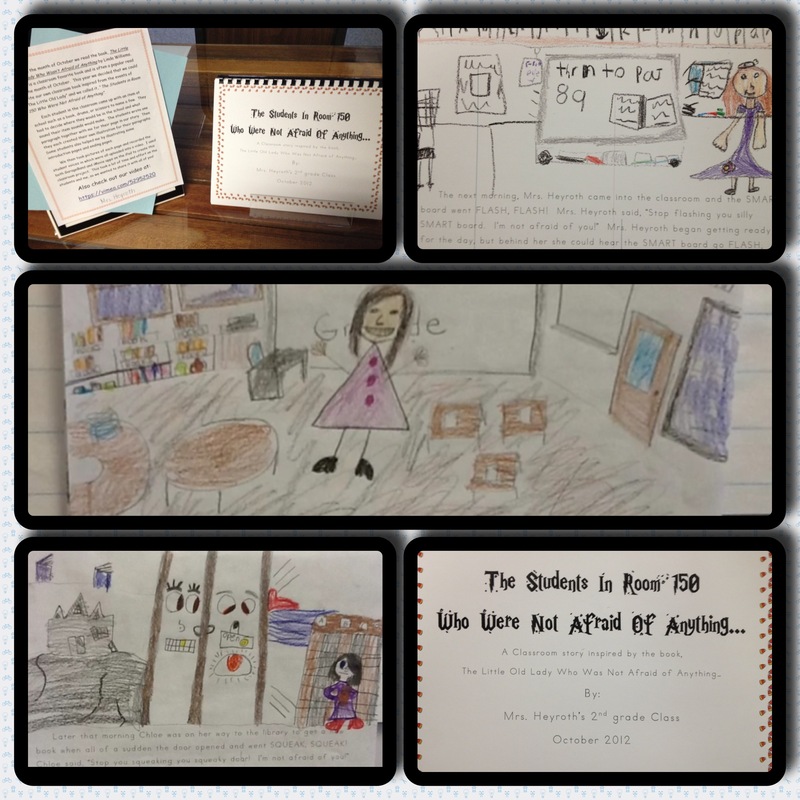 She and her students wrote a classroom book based on the story There Was an Old Lady Who Wasn’t Afraid of Anything. Better yet, she used GarageBand and iMovie on her device to create a digital version of their book. Each student was recorded reading one of the pages. I recognized her efforts by pulling some pictures together and sending her a collage using Frame Magic. I also plan to share this with the rest of my staff. They can see what is possible with mobile devices such as iPads and apply this example to their own classroom. Thanks so much for sharing these great ideas! I agree that we can’t just throw iPads into the classroom and assume they are going to improve teaching and learning unless people have an opportunity to reflect on their practice and share with others. I am very keen to see how iPads can be used to enhance and capture student learning and have enjoyed experimenting with them in my classroom this year. I look forward to trying out some of the ideas you have presented as well. I have used iMovie a little but haven’t created trailers with my kids. They look really good.